“Neither party can claim to have made the gains required for a genuine, meaningful victory. That would have required capturing the ILP’s—and, to a lesser extent, the COP’s—space. “Combined, the ILP/COP share amounted to 133,400 votes. The UNC gained some 58,900 votes, meaning that some 74,500 votes or 21% of the votes remained unclaimed. For the two major parties and their respective leaders, last month’s Local Government Elections held out two very different prospects. UNC political leader Kamla Persad-Bissessar’s political neck was on the line since there was the possibility of yet another failure in a growing string of election defeats since 2010. 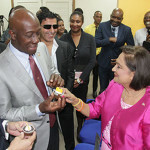 For the PNM’s Keith Rowley, it was the first public examination of the party’s stewardship and of Dr Rowley’s leadership. The UNC proclaimed “victory”—as they are wont—in six and a half corporations. The actual results show PNM 7, UNC 6 with a tie in Sangre Grande. 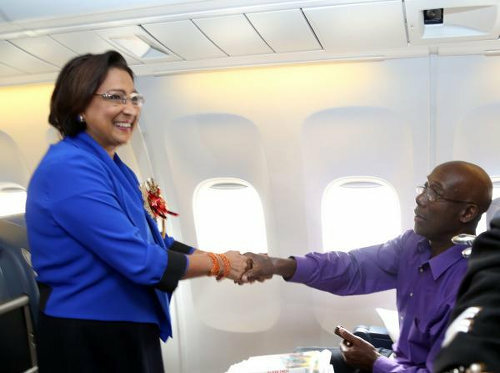 A closer look reveals that, out of 137 seats, the current ruling party, the PNM, has lost one while the former ruling party, the UNC, has gained two. 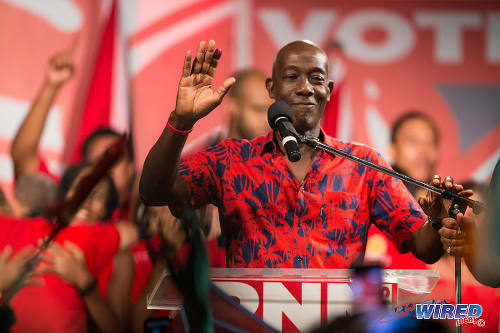 In the face of very difficult economic conditions and an Opposition that is demonstrably non-co-operative and obstructionist in the Parliament, the PNM leadership seems almost relieved at the results. And why should they not take solace and comfort in results which, given what they have been up against since they came to power last year, could so easily have been considerably worse? 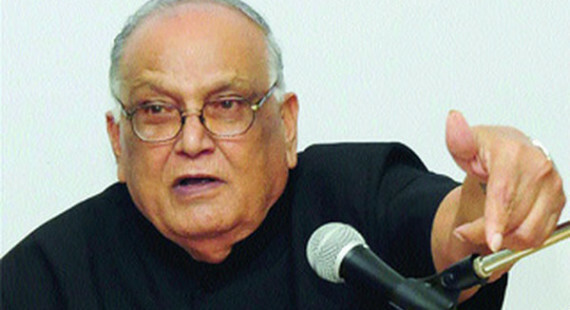 Of course, those within the PNM and without who are wont to look at the empty half of the glass will point out that on the campaign trail—confident that their eight 2013 corporations were safe—the PNM Political Leader and his support staff made no secret of the fact that they had their eyes on Siparia and Chaguanas. 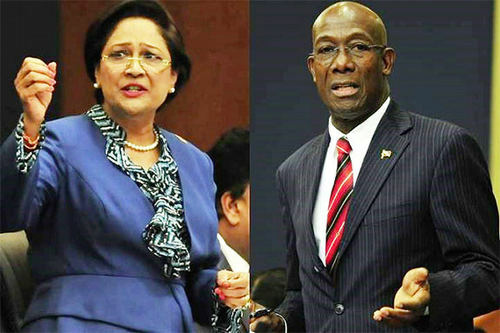 Fired by the possibility of capitalising on their ascendancy in last September’s General Elections, Dr Rowley and company strove manfully to wrest one or both of these two seemingly vulnerable corporations. 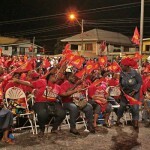 That they did not might mean that Persad-Bissessar’s political neck remains safe—for now! 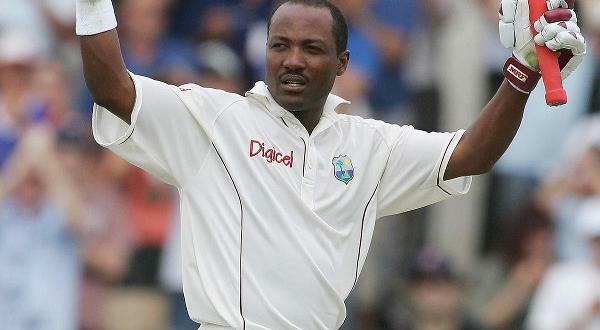 The results have provided maybe not real breathing space but at least a psychological boost to Persad-Bissessar. The mocking pretenders to the UNC throne will have to bide their time, to wheel and come again. On the PNM side, there’ll be no weeping and gnashing of teeth. 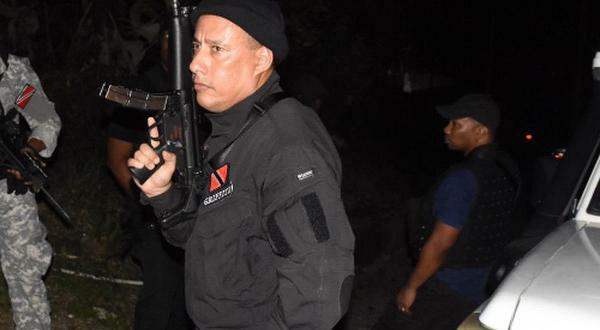 But there will have to be serious introspection and interrogation to determine just why the herculean efforts to breach the UNC’s strongholds failed to bear real fruit once again! Was there a clear strategy to try to capture the ILP space? Was there a clear strategy to mobilise the party’s own supporters who have traditionally not considered the LGE as important? 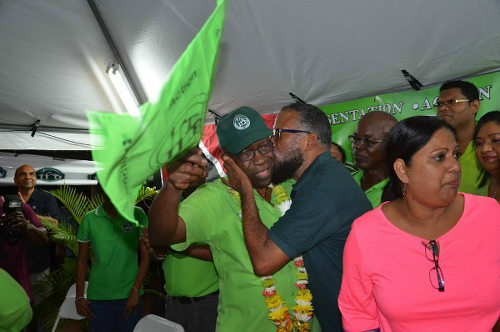 Photo: ILP political leader Jack Warner (centre) gets a kiss from an enthusiastic supporter during a cottage meeting in 2015. I think it might be useful to take a closer look at what the numbers have to tell us, starting with the LGE of three years ago, when the ILP was a contender that had to be reckoned with. In 2013, the turnout was unusually high; in fact, the 43.6% figure was a record for local government elections. In the event, the PNM polled 190,421 votes or 42.3% of the votes cast, which gave them eight corporations. The UNC polled 121,944 votes. To this, add 33,258 COP votes which gave the then Partnership Government a total of 155,202 votes (34.5%) and six corporations. 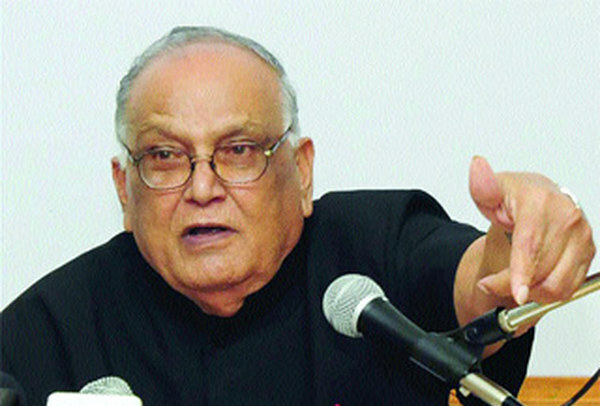 The ILP polled 102,304 votes or 22.7%, which left them without any corporation. The details of the three corporations that come into sharp focus in the wake of the recent elections need highlighting. In Chaguanas, the PNM polled 9,003 votes or 28.2% of the votes cast. The UNC/PP polled 10,840 or 33.9% and the ILP 11,968 or 37.5%. The seat allocation was PNM 3, UNC/PP 3 and ILP 2—requiring the crucial intervention that gave the UNC/PP control of the Corporation. In Siparia, the PNM actually got more votes than the UNC/PP. The PNM polled 13,882 votes or 41.1%, the UNC/PP 13,212 or 39.2% and the ILP 6,270 or 18.6%. That yielded a seat allocation of PNM 4 and UNC/PP 5. Photo: UNC political leader Kamla Persad-Bissessar celebrates victory at the 2010 General Elections. 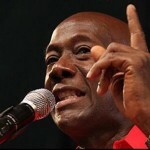 So it is not hard to imagine Dr Rowley licking his chops at the prospect of bringing home Siparia and seeking to convince the PNM backroom strategists that there was a real possibility of making a measurable gain in that area and throwing the UNC—and, a fortiori, its leader—further into the bamboo! In Sangre Grande, the PNM polled 10,005 votes or 40.7%, the UNC/PP polled 7,797 votes or 31.7% and the ILP polled 6,800 or 27.6%. The seat allocation was PNM 5 and UNC/PP 3. The math there was easy: Ceteris paribus, the PNM would be home free if it could capture about one-third of the ILP’s share. The EBC’s results for November 2016 show that the PNM polled 174,754 votes, some 15,667 less than in 2013. The UNC in contrast polled some 58,914 votes more than they did in 2013, a total of 180,858 votes. The ILP polled 343 votes, 101,961 votes less than 2013. The lower voter turnout, at 34.34% almost a full 10% less than the 2013 figure, is not far from the LGE average. So what is there worthy of note in these latest elections? Well, quite a few things. For starters, it has to be said that, with the 2013 ILP aberration off the scene, the voting pattern is back to ‘normal’. We again have two dominant parties, one controlling the East-West Corridor with pockets in Pt Fortin and San Fernando and the other controlling Central and South. But the data suggest that neither party can claim to have made the gains required for a genuine, meaningful victory. That would have required capturing the ILP’s—and, to a lesser extent, the COP’s—space. Combined, the ILP/COP share amounted to 133,400 votes. The UNC gained some 58,900 votes, meaning that some 74,500 votes or 21% of the votes remained unclaimed. If there is only one November 2016 statistic that has relevance to the general elections constitutionally due in 2020, it is that 21%. Why? Well, in 1981, the ONR claimed 22% of the votes cast and the COP also tallied roughly the same percentage in 2007, both without winning a seat! I submit that we already have a good idea of the likely size of the floating vote in 2020. In a two-horse race, if neither side is able to claim this middle ground, then the situation will be tight, tight, tight. History shows that, in the presence of a third party—e.g. ONR, COP and latterly ILP—the 20-22% floating vote allows the PNM a comfortable win. However, when the political forces opposed to the PNM combine, as was the case with the NAR of 1986, the UNC/NAR of 1995 and the PP of 2010, Opposition is usually the PNM’s lot. 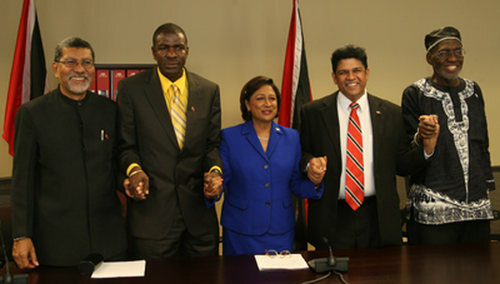 Photo: Former Trinidad and Tobago Prime Minister Kamla Persad-Bissessar (centre) with fellow People’s Partnership leaders (from left) David Abdullah, Ashworth Jack, Prakash Ramadhar and Makandal Daaga during their term in office. But, as the recent elections have again shown, the danger for the PNM lies in the propensity of its support base to shift, albeit slightly, and/or stay away. Last month, some 15,667 of those who stained their fingers for them in 2013 did not do so, a loss of 8%. Analysis of the data over time suggests that, all things being equal, the UNC’s support base remains firm and unwavering. If I were to make a pronouncement on this local government election, I would venture to say that the PNM lapsed! Not badly but lapsed nonetheless. 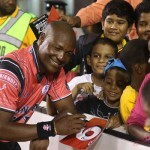 In their anxiety to deliver a crippling blow to the UNC, they pushed their head out in Siparia and Chaguanas but exposed their tail in Sangre Grande. Looking ahead to the 2019 Local Government Elections and the General Elections in 2020, all things being equal, whichever side is able to devise and implement a strategy to capture the 20-22% floating vote is likely to emerge as the winner. Photo: Whaddap, cocoyea! 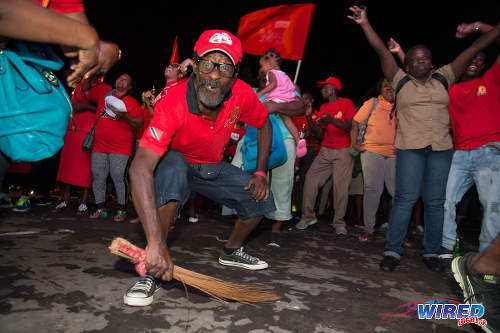 A PNM supporter celebrates at Balisier House after the election results on 7 September 2015. Trinis not serious. Everybody I spoke to I doh usually vote for local. They eh care eh no about any reform. They living as is business as usual. 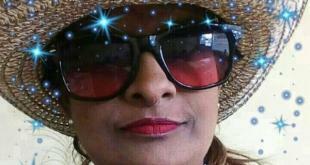 Todays hot topic scanning my pic 4 a ticket to a fete. Even if they turn out lower for local election – this year was the lowest in more than thirty years!!!!! Surely you overstate the importance of the statistic. Apathy about the LGE is the norm; why would you have expected that to change? If before the next LGE, the PNM does go through with the reforms it said it is proposing to implement and the turnout figure remains unchanged, then maybe you’ll have a case. For the moment, however, this is just so much hot air, including a completely gratuitous attack on the integrity of your (now former?) friend Warren. As (he might add) usual. Hopefully we will hear from Akins Olatunji Vidale from that at some point. Well I was curious to see if the unions created a third option. And they didn’t.